Bjørn Lomborg writes on his Facebook page of a reverse hockey stick graph, one that is certainly inconvenient to the gloom and doom message of climate alarmists who try to link regular weather events to climate. So, Lomborg plays their game, and the results are surprising. Instead, look at the number of dead per year, which is much harder to fudge. Given that these numbers fluctuate enormously from year to year (especially in the past, with huge droughts and floods in China), they are here presented as averages of each decade (1920-29, 1930-39 etc, with last decade as 2010-17). The data is from the most respected global database, the International Disaster Database, http://emdat.be/emdat_db/. 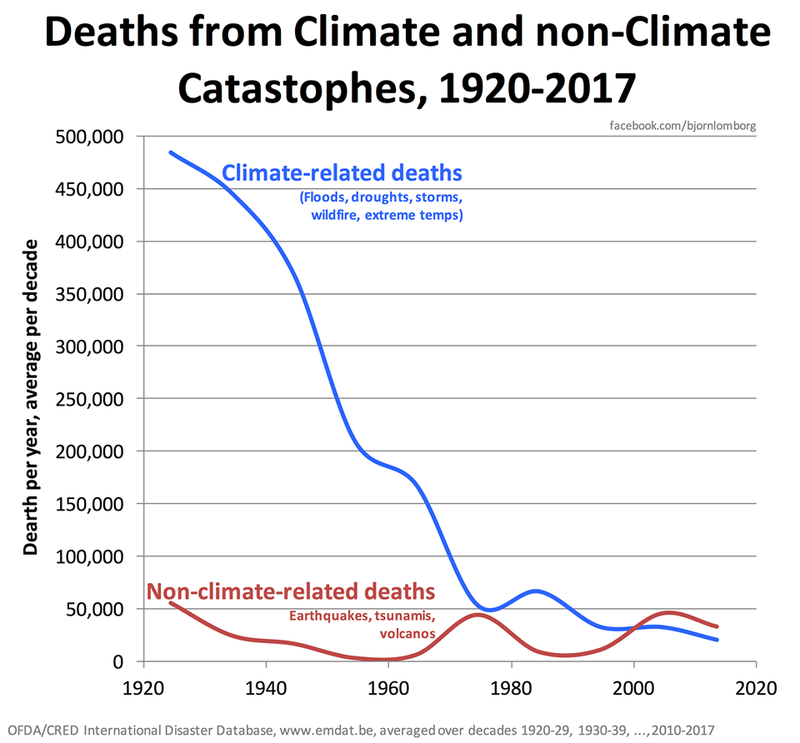 There is some uncertainty about complete reporting from early decades, which is why this graph starts in 1920, and if anything this uncertainly means the graph *underestimates* the reduction in deaths.